To stave off Ohio’s job losses resulting from deindustrialization, Kent State political science professor John Logue founded OEOC, which over the course of nearly three decades has assisted tens of thousands of workers in sharing in the ownership of the companies where they work. Logue combined a political vision of a more just, democratic society with the practical assistance services to develop ESOPs. OEOC saw an immediate need to develop and prepare individuals who were not used to being in positions of decision making and lacked the educational grounding for competent ownership over Ohio firms. "So the educational component developed fairly quickly on and the breadth of programming was good," says executive director Roy Messing. As a result of Logue's efforts, the Ohio legislature passed the Ohio Employee Ownership Assistance Program in 1988, and over intervening years created new programs to facilitate succession planning, employee ownership opportunities in moments of job site closures, and state lending in support of employee ownership. In Ohio over nearly three decades, OEOC has helped 92 companies convert to some form of employee ownership and has created 15,000 employee-owners at a cost of $772 a job, with each worker-owner benefiting on average from $40,000 in wealth creation. Within the OEOC network, a majority of firms are 100 percent worker-owned, and most are mid-sized, with 5-10 percent of employees serving as management; 10-15 percent as middle management, and the rest as shop-floor workers. Service and manufacturing firms are roughly even in number. 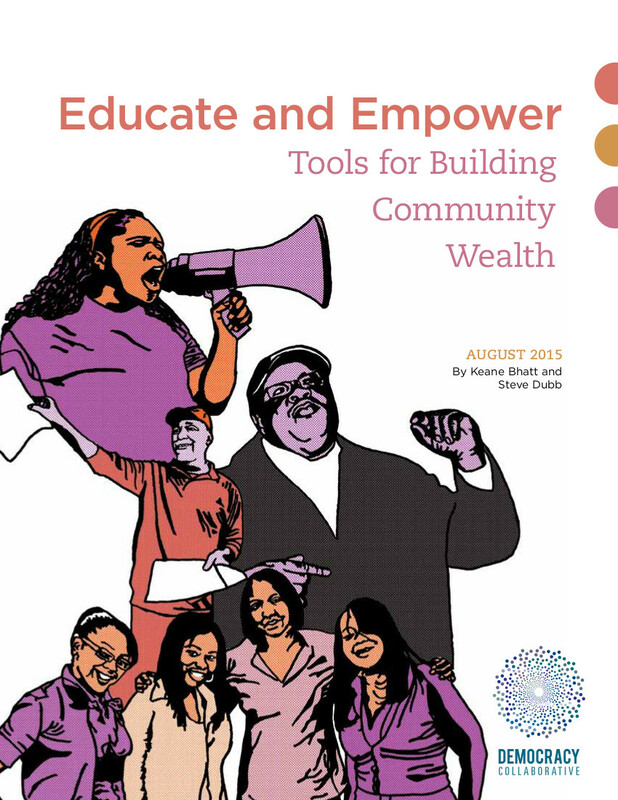 Learn more about the Ohio Employee Ownership Center and other innovative community wealth building initiatives in our report Educate and Empower: Tools for Building Community Wealth. Team- and culture-building are not luxuries; they're essential to performance: Program coordinator Chris Cooper notes that research on employee ownership shows that when a financial stake is combined with the ability to influence one's job, effective intra-firm communication strategies, and investment in culture to make ownership real, the enterprises are more productive, more profitable, experience lower turnover, offer better benefits, better health coverage, fewer layoffs, and they weather recessions better. Institutionalize and provide space for opportunities to offer input: Excellence By Owners (EOB), says Chris Cooper, is a business that proves the value of creating frameworks for interaction between labor and management. A lower-level employee formerly at a medical chair lift company approached his supervisor to create an offshoot company, and then was able to present the idea to higher-ups, who then gave the employee a year to build a prototype product and business plan. The offshoot business turned the company's trend line from flat to positive. "The firm had processes to encourage listening by management, and patience to give a small team the requisite space to carry out the project," says Cooper. "So it's more than the ability to listen to employees' complaints, but the ability to act on good ideas too." Participate in trainings, retreats and workshops within the broader sector: As a convener of sectoral activities, OEOC sees participation as key in empowering rank-and-file workers, who, perhaps out of inertia, will not act on their ownership without deeper engagement and skill development. Messing explains that the OEOC network's retreat for non-management-level worker-owners from five to six different companies do team building, communication, and the employee ownership game, in which the group's decisions change members' incomes. If four employee-owners come from six firms, everyone will have had the opportunity to interact with one another, and Messing argues this is a crucial way to link daily activities to the profitability and functioning of the ESOP. Retention of jobs has immediate, if less recognized community pay-offs: While initiatives to create new jobs make the front page of the newspaper with ribbon cuttings, conversions to employee ownership save jobs and are more cost-effective, says Chris Cooper. Community organizers should look closely at opportunities at conversion, given the enormously stabilizing impact this can have and the comparative ease of conversion over building start-up enterprises. Job retention efforts beg for foundation involvement: The Great Recession has had a large impact on limiting the kinds of services that OEOC had been able to provide for free to a variety of interested parties, and state-level funding resources have dried up. If foundations are interested in protecting the economic vibrancy of local communities with a limited pool of assets, supporting entities like OEOC provides an enormous return on investment. OEOC has created 15,000 employee owners at a cost of only $772 per job created or retained; in comparison, according to a study by Good Jobs First, state and local governments on average spend $456,000 on average in subsidies per job created.